Bird’s nest fungus. Photo by pellaea, Flickr Creative Commons. With all these wonderful rainy days the forests are probably bursting at the seams with mushrooms. Some mushrooms, like the bright scarlet waxy cap or the colorful coral fungus, immediately draw your attention as they poke up out of the brown redwood duff. I love hiking through the forest and discovering the almost-hidden mushrooms just barely peeking out from under the leaf litter or next to a fallen log. One of my favorite redwood mushrooms is the bird’s nest fungus. Not only does this mushroom look really cool, like a bird’s nest with little eggs in it, but it has an interesting story as well. Bird’s nest fungus, in the family Nidulariaceae, is obviously named for its appearance. This fungus receives its nutrients from decaying wood and plant matter, and therefore is commonly found on fallen logs or branches. What is most interesting about this fungus is how it reproduces. The mushroom forms a structure that looks like a small bird’s nest. 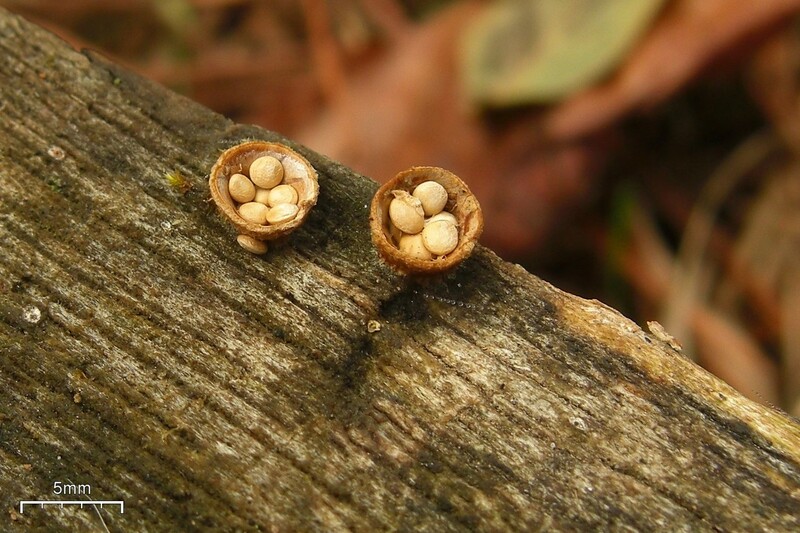 In the “nest” are tiny flattened spheres which look like eggs. These spheres are small capsules called peridioles which house the spores. The “bird’s nest” is shaped in a way that it becomes a perfect splash cup. When a raindrop falls and hits the cup of the mushroom, it has enough force to propel the peridioles into the air, up to a meter away! The peridioles can then land on a solid surface, such as a leaf or twig, and stick to it. From there, the spores are released and the whole life cycle starts over again. If you have seen one of these mushrooms in the forest or your backyard, please send us a picture through our Facebook page! Make sure to check out this rockin’ video of spore dispersal with the bird’s nest mushrooms.